WASHINGTON, DC, June 14, 2010 (ENS) – To provide the latest information about where the BP oil spill is and where it is headed, shipping lane closures, fishery closures where responders are taking action, and many other types of information, federal agencies have created a new website with an interactive map. GeoPlatform.gov/gulfresponse is a new online tool that provides near-real time information about the response effort in the Gulf of Mexico to the ongoing disaster. The spill began 56 days ago on April 20 when the Deepwater Horizon oil rig, leased by BP, exploded and burned, claiming 11 lives and leaving the damaged wellhead spewing oil into the gulf. Developed by the National Oceanic and Atmospheric Administration with the U.S. Environmental Protection Agency, the U.S. Coast Guard, and the Department of Interior, the site offers a one-stop shop for spill response information, NOAA says. 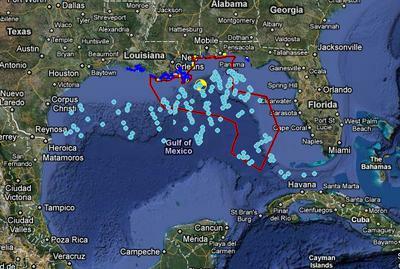 The site integrates the latest data the federal responders have about the oil spill’s trajectory with fishery area closures, wildlife data and place-based Gulf Coast resources – such as pinpointed locations of oiled shoreline and current positions of deployed research ships – into one customizable interactive map. Looking at the map, visitors can see that the area of the gulf that NOAA has closed to fishing is about the size of the state of Florida. The closed fisheries area now represents 78,264 square miles, which is approximately 32 percent of Gulf of Mexico federal waters. The closed area does not apply to any state waters. GeoPlatform.gov/gulfresponse employs the Environmental Response Management Application, a web-based GIS platform developed by NOAA and the University of New Hampshire’s Coastal Response Research Center. ERMA was designed to facilitate communication and coordination among a variety of users from federal, state and local responders to local community leaders and the public. The site was designed to be fast and user-friendly, and NOAA plans to keep it constantly updated. The mapping tool includes only those vessels equipped with the automatic identification system and so is not representative of all the vessels supporting the largest oil spill response and recovery operation in U.S. history. More than 25,600 personnel are currently responding to protect the shoreline and wildlife and cleanup vital coastlines. More than 5,400 vessels are currently responding on site, including skimmers, tugs, barges, and recovery vessels to assist in containment and cleanup efforts – in addition to dozens of aircraft, remotely operated vehicles, and multiple mobile offshore drilling units. Approximately 2.35 million feet of containment boom and 3.2 million feet of sorbent boom have been deployed to contain the spill, and approximately 485,000 feet of containment boom and 1.85 million feet of sorbent boom are available. Approximately 20.4 million gallons of an oil-water mix have been recovered. Approximately 1.26 million gallons of total dispersant have been deployed – 870,000 on the surface and 392,000 subsea. More than 525,000 gallons are available. More than 192 controlled burns have been conducted, efficiently removing a total of more than 4.3 million gallons of oil from the open water in an effort to protect shoreline and wildlife. Roughly 67.2 miles of Gulf Coast shoreline is currently experiencing impacts from BP’s leaking oil – 34.6 miles in Louisiana, 7.5 miles in Mississippi, 11.7 miles in Alabama, and 10.4 miles in Florida.